I actually coughed up the cash to buy this book in hardcover, because it just looked so beautiful. The light blue background, the tree branches, the hearts, the poetic title...it spoke to me. Of course, the morning I put the book into my work bag also happened to be the same morning I failed to tightly seal my coffee thermos, which was—you guessed it—also in my bag. Fortunately, by lunchtime the book had mostly dried, so no reading time was lost in the tragedy. And not even java-tinted pages could detract from how incredibly beautiful this book is, in design but more importantly in content and voice. Isabelle and Giselle are twins, teenage girls in the back seat of their parents' car on their way to a school concert. Their car is broadsided, and Giselle wakes up in the hospital with only murky memories of the crash and what happened after. She isn't able to move or speak, so she's left to puzzle everything out alone in her head: what happened to the rest of her family? Why are the police saying the wreck might not have been an accident? And why do the doctors keep calling her Isabelle? I don't really go in for super-sad, sappy fare. 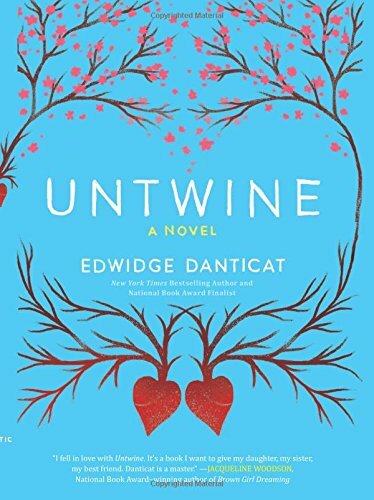 If Untwine had just been a book about a girl who suffers a tragedy, I would have abandoned it quickly with no remorse. No cover is beautiful enough to keep me invested in a sobfest. But the mystery element of the book is surprisingly well-developed and compelling. I wanted to know what really happened as badly as Giselle did, and the answers, when they came, were poignant and heartbreaking and still somehow satisfying. I've been curious about Haitian-American Danticat's writing probably ever since Breath, Eyes, Memory was on Oprah's list years ago, but never made the time to check her out. I think Untwine was the perfect introduction. There are moments of real beauty in her prose. If she can write this lovely a book for a young adult audience, I can't imagine not liking her adult fiction offerings. TagsA Touch of Melancholy, Abandonment Issues, Bittersweet Life, Complicated Sisterhood, Put Me Inside Someone Else's Head, They're Twins!